This has to be top of the hit list for first time visitors to city. Unsurprisingly, it was listed by UNESCO as a World Cultural Legacy in 1987. 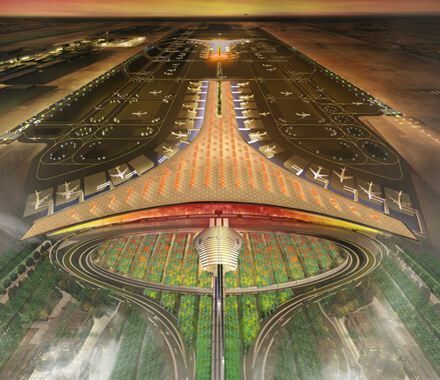 It spans 6700 km and it took over 200 years to complete. The intention was to keep invaders out and the locals in. 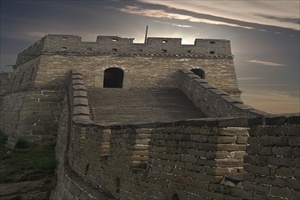 Qin Shihuang (221-210 BC), the first emperor of the Qin Dynasty ordered the building of the wall to keep out the Huns from the North. At its closest point it is less than 60km/40 miles from city. Open 7am to 6.30pm. 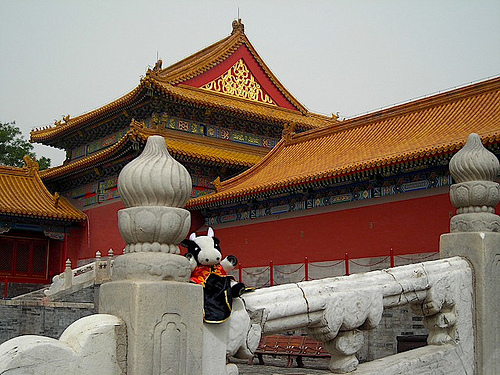 Lying at the center of city, the Forbidden City was the imperial palace during the Ming and Qing dynasties. Now known as the Palace Museum, and is now the world's largest palace complex. Splendid painted decoration on these royal architectural wonders, the grand and deluxe halls, with their surprisingly magnificent treasures will certainly satisfy 'modern civilians'. 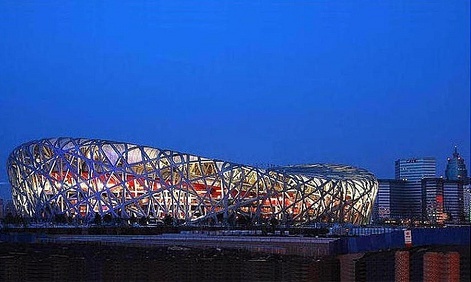 Designed by award winning architects Herzog & de Meuron, this futuristic stadium that resembles a bird's nest hosted the track and field events during the 2008 Summer Olympics. It is especially beautiful at night when the stadium's lighting system is activated. Temple of Heaven (Tiantan) is China's largest existing complex of ancient sacrificial buildings. The principle buildings include the Altar of Prayer for Good Harvests, Imperial Vault of Heaven and Circular Mound Altar. It was entered into the world cultural heritage list in 1998. Here, during the Ming and Qing dynasty, the emperor would make sacrifices during the winter solstice, and pray to heaven and his ancestors, on behalf of his people for bumper harvests. Entry Park Free, Temple RMB 30. Summer Palace Regarded as the largest imperial garden in China, Summer Palace is in fact a park-styled royal retreat. Once a summer resort for emperors, this 290-acre park-palace is still a retreat for visitors, who can take a rest here or wander around old pavilions, buildings, temples, bridges and the huge Kunming Lake. Underground City This is an underground bomb shelter just beneath the city. It was built more than 20 years ago and opened to the public in 2000. It was built as a result of the Sino-Soviet border conflict in 1969 over Zhenbao Island in northeast China's Heilongijang River. This was built in case of nuclear attack. It took 300,000 locals four years to complete the underground city and it spanned 85 square kilometres 8 metres below the surface. There were hundreds of entrances via trap doors to the shelter and most of these are hidden by shops and houses. Set among elaborate grounds of verdant courtyards and magnificent halls some 30 miles north of the city, the imperial monuments of the Ming Dynasty make for a nice afternoon spent outside the hustle and bustle of the capital. Three of the 13 tombs are open to the public, and only one has been fully excavated. Do you have the experience of taking a man-driving pedicab? In the old Beijing hutong areas, you can find the ancient transportation tools now still preserved for tourists as the main traffic tool of visiting hutong - Beijing unique old city lanes. The neighborhoods of narrow, twisting streets represent the “real life” of Beijing, where passageways connect to courtyards of traditional compact homes. The Lama Temple is city's most visited religious site and is home to the Yellow Sect of Buddhism. It is very active, with many faithfuls burning armloads of incense. The temple has an important relic: the largest Buddha statue carved from a single tree. It is quite easy to get to the temple since it is the only temple in city to have its own subway stop! Amusement Park has Roller coaster, ferris wheel and other attractions to entertain kids. The Tuanjiehu Park is a water park with a beach and wave along with a roller skating park. The Beijing Planetarium is a state of the art planetarium with a 4D Theatre where goggles are worn. Shijingshan Amusement Park is the largest amusement park in city with water slide, roller coaster, bumper cars. Situated in the Xicheng District, Beijing Zoo is the largest in China. This is a fully fledged zoo with more than 3,500 species from around the world. But its unique feature is its giant pandas. Located in Beijing 's central business district, north of Yongangli and Jianguomen subway stations, is Ritan Park and the Temple of the Sun. Dating back to the 16th century, the emperor made sacrificial offerings to his sun god on the altar. Today, though, it is a beautiful green space containing facilities for children such as trampolines, a merry-go-round, mini golf and also various food outlets. Yuyuantan Park is a great place to take children in city. Centered on a lake, it has an aquatic park, lots of child-friendly entertainment and you can hire bicycles there. In April each year, Yuyuantan Park is host to a cherry blossom festival showcasing its beautiful cherry and magnolia blossoms. Its 136 hectares contain over 2,000 different types of trees. This street is the traditional centre of Beijing that has been renovated into a pedestrian-only zone in 2000 and this is where you should go to for some retail therapy. The street is not for the faint hearted - it is very long and if you were to walk the length of it without stopping to window shop, it would take around half an hour. There are two shopping malls, one of which, the Oriental Plaza, sprawls over two blocks to the east, potentially adding another 15 minutes. Night market 5.30 to 10pm. Tian'anmen Square This is the biggest city-based square in the world and it was here in 1949, from a rostrum on Tian'anmen Guangchang (the Gate of Heavenly Peace), that Chairman Mao announced the establishment of the People's Republic of China. Tourists and locals mingle here and kite fliers use it to enjoy their sport. This is also where 8 national celebrations are held and where leaders address their people. To give you an idea of size, there are lampposts kitted with megaphones so that crowds of 10,000 people can hear. You can visit the balcony that speakers use (for a small fee) and from here you will get a lovely view over the square. At night the square is lit up giving off a lovely glow. Entry free. Zhoukoudian is a World Heritage Site about 50 kilometres southwest of the city at Dragon Bone Hill, where on the 2nd December 1929 a skullcap was discovered that provided evidence of human life between 700,000 and 200,000 years before. Further, discoveries led to what is now called Peking Man which was very similar to modern man except that the skull has a low forehead with an eyebrow that sticks out and large teeth which do not overlap. Close to the Peking Man three other adult skulls were found and is now called Upper Cave Man which is estimated to be 18,000 years old. 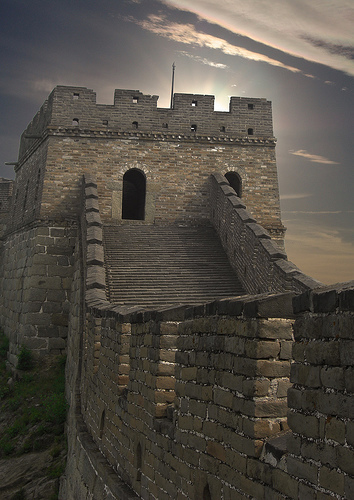 A visit to Beijing City is incomplete without a visit of its museums. There are so many museums scattered around the city. If you don't have much time in Beijing, you can limit your museum tour to Capital Museum. Beijing's new Capital Museum is now open to the public, located on Fuxingmenwai Dajie, the western extension of Chang'an Jie. The museum is a five-storey building allowing for a maximum of 13 concurrent exhibitions, which can be viewed in about 5 hours at the price of 30 yuan per visitor. The 798 art district is located in an old, decommissioned complex of military factories. There are numerous cafes and art galleries here where you can browse and purchase paintings, pottery, etc. Look out for faded Maoist propaganda slogans on the factory walls! 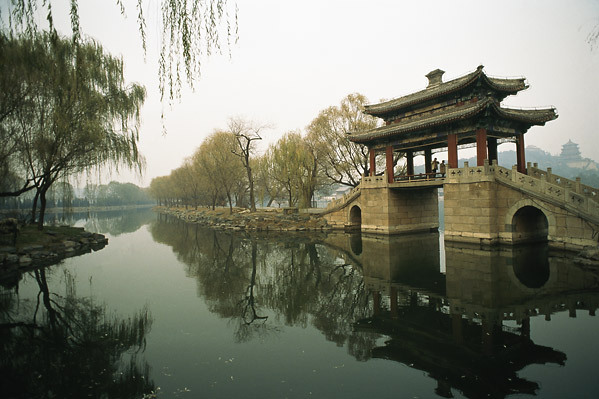 Qing dynasty emperors used to rule China from this once-beautiful complex of palaces, lakes and gardens. However, during the Second Opium War (in 1860) British and French troops looted and thoroughly burnt down most of it. Today visitors can still see ruins of the European-style palaces that better survived the burning because they were made out of stone. The Marco Polo Bridge crosses the Yongding River and is 15km southwest of city. The original bridge was constructed in 1192 and reconstructed in 1698. The bridge is 266.5 metre in length and 9.3 metre wide with 281 pillars with a lion on top each lying in a different posture. At the end of the bridge are four columns. The Marco Polo Bridge marks the start of the War of Resistance in July 1937 against the Imperial Japanese Army.